Promotional fish bone bottle openers – black is popular on marketing scene because it serves marketers above their expectations. This multipurpose token can be used as a key holder, metal split key ring, ear bud cord wrap, bottle opener and a fashion token – by wearing it over the belt wrap. Custom fish bone bottle opener – black can boost your campaign to new heights with its powerful design and utility value. This fish bone bottle opener is largely affordable to even small budget marketers. They can avail huge discounts by ordering it in bulk. 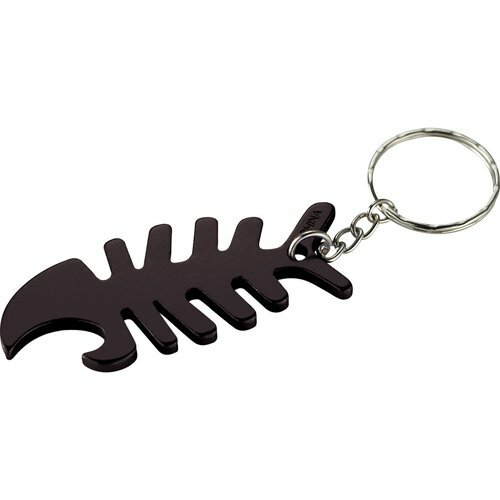 Request a quote for knowing about your share of savings on bulk orders of this fish bone bottle opener – black. Features – Black aluminum body with a metal split key ring.